In this part 2 of learn WPF we are going to talk about Controls and see how these controls are different in WPF and what capabilities it provides you build a good WPF application. Also we would see how we can handle the user input using the events and commands. ButtonBase is the base class for the any button in WPF and ToggleButton is the base class for the CheckBox and RadioButton. Now its really interesting to know that the controls in WPF are divided into two namespaces : System.Windows.Controls (Contains Button, CheckBox, RadioButton) and System.Windows.Controls.Primitive (ButtonBase, ToggleButton, RepeatButton). Primitive controls are not designed in a way to be used individually but as a part of other controls. But you would see that the RepeatButton (A button that repeatedly raises its click event when it is pressed continiously) is part of the primitive namespace but still can be used individually. The reason because it is in the Primitive namespace is because in WPF it used as a part of other controls such as scrollbar. RadioButtons are designed to be used in groups, so that only one of the RadioButton in the group is selected at a time. So when you assign the same group name for multiple radio buttons then only one of the radio buttons can be selected at a time. The grouping also works if you place all the radio buttons in one parent but if you assign a group name after that as well then then the groupname will override the parent grouping. As you might have seen in the Part 2 of Learn WPF that we could place just anything inside a button, like text, arbitrary content, data, etc. if type the below code into a WPF application you would see that you have placed multiple objects inside button. This Content Model is available for any control in WPF. It not only supports the built in controls but also supports the custom controls that are made. When you are adding just the text as content to the button you add an underscore before the letter which you want as the accelerated control for the button click. Controls don’t have to be limited to a single piece of content, some controls have 2 content property. The base class for these controls is HeadedContentControl which has the both Header and Content property. This means I can place anything in header and anything in content. You can type the following code in a WPF application and see that header and content and have the same model but at the two different places. WPF has 3 controls for Text Input. TextBox – This takes only input text as string and does not support any formatting. RichTextBox – Allows formatting of text. Although you might be surprised to know that RichTextBox does not use the Rich Text Format internally. It uses WPF’s FlowDocument internally for formatting. This is actually good because you will find easier to work with WPF text model then to work with native RTF. Now you might think then why is it called as RichTextBox, the reason is that Windows call anything that supports rich text as RichTextBox. Also it supports RTF because whenever you copy any rich text from the clipboard to the RichTextBox it will treat it as rich text and vice versa as well i.e. when you copy text from RIchTextBox to Clipboard the formatting is not lost. Both TextBox and RichTextBox derive from the same BaseClass which is TextBoxBase and hence support some common clipboard operations like copy, cut, paste. PasswordBox – This textbox does not share the same base class as the other two. This is designed for editing password and the reason why it does not use the same base calss is that it does not want to offer some clipboard operations like copy, cut as these cause security risks. The TextBox and RichTextBox both support spell check functionality. 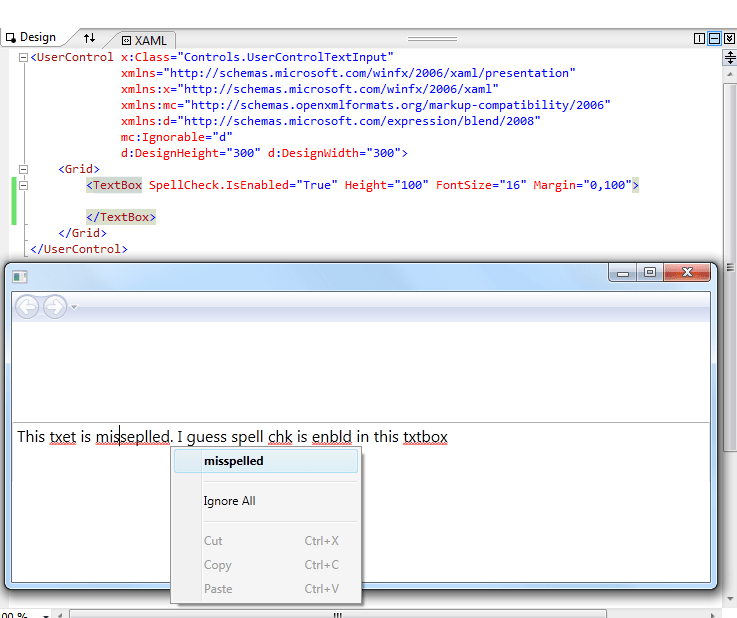 All you need to do is to set the SpellCheck.IsEnabled equals True and you would get spell check in the textbox. When you type a wrongly spelled work into the textbox you would see a red underlined in the misspelled word and also when you would right click on the misspelled word it will give you options to correct the spelling. When xaml comes across the dot in SpellCheck.IsEnabled it treats the IsEnabled property as an attached property (An attached property is one which defined by a different class than the target object). So here the property is being used by the Textbox but the Property is defined in the class SpellCheck. This might seem a little odd to you at first but if you think about it, it’s an excellent idea to add properties to existing classes without modifying them. The way a xaml compiler interprets this attached property is as below. So the SpellCheck class uses these access methods like get and set to access the attached property and that’s the exact same way the mobile .NET property really do. Now most the times we have a label in front of our textboxes and we might want to focus to the textbox using a keypress. Now if use the following code then we could achieve what we intend to. I would say the main job of the label is focus targeting. If you want to just display some text then I would recommend a TextBlock. That’s what a Label uses internally. If you just want to display some text not use focus handling then using a label will be overkill. Slider, ProgressBar and ScrollBar share a common base class named RangeBase. These share common properties that they define values within a range. Slider and Scrollbar provide you an option to drag and change the selected value where as in PrgressBar we cannot do so. There are many items in WPF that can display multiple items like: ListBox, ListView, TreeView, ComboBox and they derive from a common base class which is ItemsControl. This class provides the Items property to hold the child items and also common sets of events along with the databinding support. As you see in the image below that except the TreeView all the other Items Controls derive from class selector which provide the provide the property to handle a selected item but you can still select items in the treeview as well. Actually the selector should have been named as an IndexedSeletor as it provides the indexed selection property. And as the Indexed selection property only makes sense for linear lists hence so those are the classes which are derived from the selector class. You will also notice that the ListView is derived from a ListBox and the only difference between a ListBox and ListView is that ListBox does not have support or Column Headers. All the Items Controls have a Content Model which is similar to Button that we have already seen before and supports any number of child items. If you put the code shown in the image in a WPF app then you would be able to realize how flexible the Items Control are. As any items Control is very flexible this negates the need of a DataGrid which is not present in WPF. Some other Items Controls are Menu, Tab Controls (Derive from the Selector class) and Toolbar. So we can generate the content of these controls as well from data binding. The Button and Label derive from Content Control class that support only a single content property. This is also the base class for Window as Window supports only one content. Headerd Content Control which derives from the Content Control and is inherited by Exapander, GroupBox and TabItem. So you have a have a header along with content. Items Control which provides the Multi Content Model. Each item in the list gets its own instance of it content model. Headered Items Control which derives from the ItemsControl but adds an header just like the Headered Content Control. 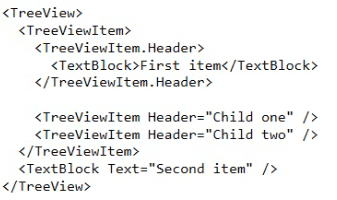 So this is used by Items Contols that have children and also use a header like TreViewItems, Menu Items. It’s also possible add new Content Model. Tunneling Events – These events start from the Root Element and move down the child elements towards the Target Element. These represent the Preview Events. Direct Events – These events do not route at all but just directs towards the target element and that’s all. These used at place where tunneling or bubbling does not make sense like mouseEnter and is only raised for target element. 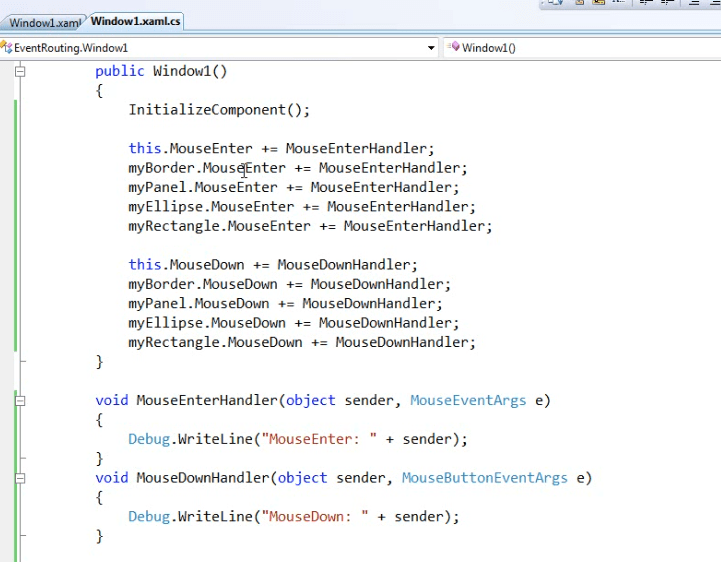 As you would see we have used MouseEnter and MouseDown Events handler. When we write the code like above and add handler using += then the code and xaml and very tightly coupled. The code makes assumptions about the xaml but the xaml does not have any assumptions about the code. But we add method names into the xaml we have xaml also making assumptions and there methods and handler are treated as attributes. Also when you used Visual Studio or Blend they add function names in the xaml and hence we wish to rely on these design tool s then we should utilize the xaml attributes approach. If have a look at the output widow while running the application you would see that the mouse enter events are direct events and the mouse down events are bubbling up. If we remove the background for border and the stackpanel then the white area which you see is the window and the same will be reflected by the Mouse Enter and Mouse Down events. Also if you change the background to transparent for stackpanel and border we would have the same look as no background but will behave the way there is a background. Now if want the bubbling to stop then we can add e.Handled = “true” to the event handler where we want it to stop bubbling further. Let’s add some more code to the cs file. So when you click on a button the background will turn green. But we have not used event bubbling. 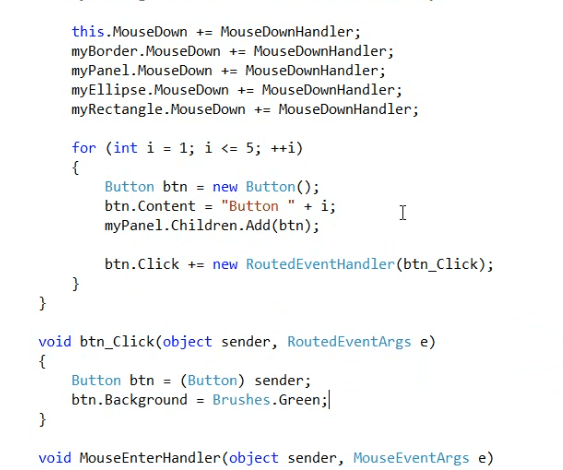 So lets change the code a little bit to use event bubbling, so lets add the handler to the stackpanel to handle the button click. When we run this we will get an invalid cast exception, so we need to change the code again a little bit. The event is not originating from Button, its originating from the element to which we have attached the event handler to. But need to note here that these commands do not actually do anything. These commands are nothing more than a name unless you define as what these do would. But the controls in WPF have defined these commands in their implementations. Like the textbox has defined the implementation of the copy, cut and paste command. The pattern for the command is that commands on their own do not mean anything but they need to execute in the context of a particular control. So lets implement a command handler. Put the following code in a WPF application. When you will run this app you will see that both the buttons have greyed out. This is because these do not know what to do with these commands. So let’s provide a handler for these commands to work. So add the following code in the code behind and you would see the commands working. You could also use CanExecute property to decide at the runtime as to whether that property is available to run or not. We could also bind the commands with the Menus. So we add built in commands to menus then the menu will be able to figure the shortcut key for each command and show it. It is able to do that becase each builtin command knows what its shortcut key is. Also we don’t have to say ApplicationCommands.Copy. Also we have not specified the command objects text and so the menu looks up the display text for the commands and shows that. So the commands display the local language display text. But the access key is not available for the Menu items so if we want the menu items to have access key we need to specify the header. The reason that it is not done automatically is that commands are at application scope whereas the access keys are menu item scope for example in File Menu P would mean Print but in Edit menu P would mean Paste. Now when you run the app you would see that the commands are working without writing any code that is because TextBox has registered the command binding for these commands. If we do not wish to use commands we could input gestures to provide the keyboards shortcuts for these items. In this I am going to start talking about Windows Presentation Foundation or WPF in short. I hope you guys find this series interesting and informative. So once you have decided to Learn WPF do not a step back or leave it in between because once learn the full power of WPF you would know how to create windows and web applications with awesome graphics easily. At the very basic level WPF is just a framework which is used for building Windows application. Before WPF the windows applications majorly used couple of dlls (User32 and GDI32). These were the 32 bit versions of their 16 bit parents who were introduced in mid 1980s. Now if you have worked in Windows Forms you would know that the interface that you used to create an application were just a wrapper around these dlls. But WPF does not use GDI32 and barely uses USER 32. It’s not just a wrapper around these dlls. WPF was introduced as part of .NET 3.0 framework. It contains both managed and unmanaged code. It was designed from scratch so that .NET languages could be used to program in WPF. You would need to use .NET to use WPF as these are no public unmanaged API offered for this. This provides a lot of advantages as you don’t have to struggle with the issues you face using a wrapper around the unmanaged code. You need to be either on XP SP3, Vista, Windows 2003 or above to use WPF. You might still be wondering as to what’s the thinking behind creating a new framework such as WPF when we already have a Windows Forms for creating a Windows application which is used by lot of people and huge numbers of people are skilled in it. The reason is Microsoft did not want to lag behind after all the thinking and market changes that have happened since the initial framework for creating windows application was launched and was really hard to keep the future versions compatible with it ancestors. As whenever an upgrade happens to a new version, people expect it to be really smooth. At the time when the initial Windows application development architecture was designed then the computer was not capable of so much processing power or graphical capabilities. Nowadays the computer hardware capabilities have progressed in leaps and bounds. So there was a need to design a framework that could utilize that capability. WPF provide the interface using which could design rich graphical user applications without having to deal with complexity of the directx or OpenGL code. Now the old dlls that were used in creating WPF application does not provide any way of utilizing the directx capability unless you are ready to program in directx or OpenGL. WPF is also auto scalable by default which means that if you run you WPF application on machine with different DPIs you application will automatically scale its contents according to the DPI and resolution of the machine. You can simply see that in action by simply creating a WPF application and zooming into it. If you zoom into other applications or graphics in your system you see it getting pixelated but with WPF you will not see that. As the times have changed, people’s expectations from the applications have changed. A decade ago people were okay with console application running on their computers but today they want a rich and cool user interface to work with. The games that we see now have reached that level and same can be achieved for windows application using WPF. You can make your complete application be blended into a single theme that you want, like your company logo colors, etc. It was easy to make websites carry branding before using HTML as anyone without any programming experience can also use HTML to make a nice looking website which corresponds to your company. WPF also utilizes the power of Markup to give the designer the ability to do more and be part of the graphical interface easily. The use of markup makes the Windows apps move forward to the level of web apps styling easily. Now in today’s time we do have the option to create a visually appealing application but the problem is to integrate all those component together that make that visually appealing application. We do have HTML for Web, Win32 with easy interface for Windows applications, DirectX or OpenGL for developing rich graphics application and Flash for designing rich vector graphics but all these have different capabilities and it’s really difficult to integrate all of them together. But WPF provides us with a single integrated solution for it. The capabilities that WPF provides are already available with the technologies I mentioned before but the advantage with WPF is that it provides all these capabilities at one place and integrated. As you could see in the image below the basic architecture of WPF is designed with directx at its base above kernel. WPF utilizes the 3D hardware your system to render 3D or 2D graphics on your system. On top of Directx level is the most basic component of WPF called as the Media Integration Layer or MIL. This is the component that takes the various types of media like the bitmaps, images, videos, etc and renders them all into a single directx surface. This MIL is unmanged code because it has to talk to directx and there need to be lot of calls need to be made to the com interface while dealing with directx and directx uses a lot com calls as they are cheap in its context but when you come to .Net code that is not the case. Using com from needs you to go through the interop layer and made thousands of call through the interop layer wil burn a lot of CPU cycle. So that’s the advantage to MIL, as to render a complex shape you make just one interop call to MIL and MIL then internally makes thousand and hundreds of com calls to DirectX to render that shape. Above the MIL we have two dlls for WPF. Presentation Core and Presentation framework. 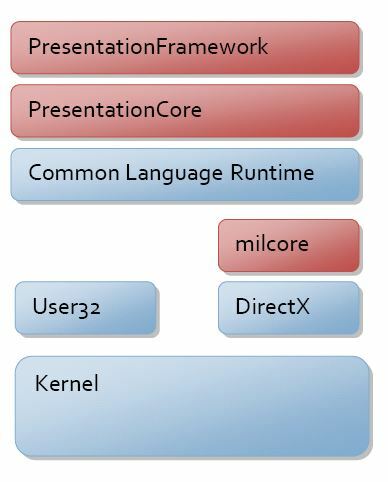 Presentation core is the public face of the MIL, it provides the .NET API that exposes he rendering services of the MIL. Above this presentation core we have the Presentation Framework layer that provides the high level services. Presentation layer provides the concept of Controls, layouts, data binding, animations, etc. As a WPF developer you would be spending most your time with Presentation framework. And you would be using the Presentation Core at the time graphics programming. 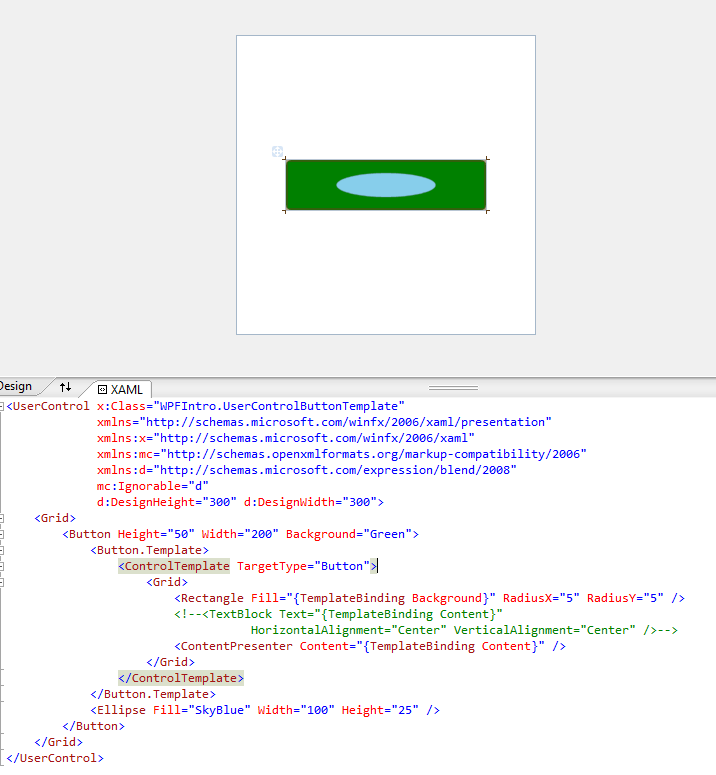 The reason for separation of these layers is to make the rendering available without being dependent on WPF features. When you create a WPF application you would see two code files in your project. One is the regular .cs or .vb file which is your standard code file and the other one is you XAML file which is something new to WPF. 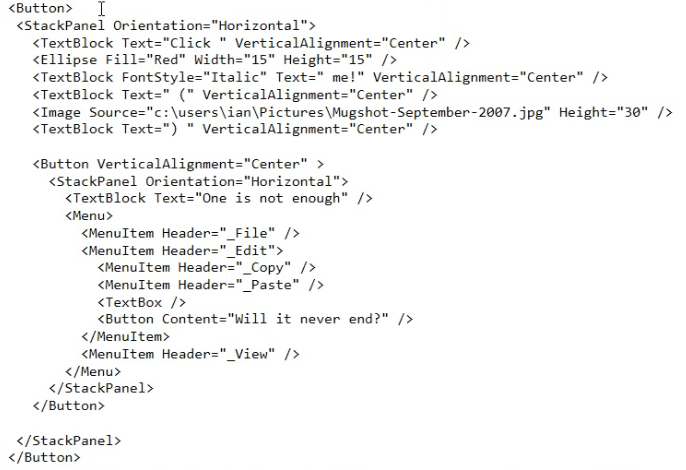 Now a XAML file looks a lot like a XML file. Now if you would have created a WPF application in the past then you would have seen XAML. I would like clarify here that XAML is independent of WPF and WPF is independent of XAML. They are separable. XAML is nothing but a language to create .NET objects and this means we could what we do XAML in C# or VB code as well. It’s on you to decide what to use when. So if you see the image below you would find XAML and its corresponding C# code. Now XAML uses the type converter infrastructure to map the string and integer values to map to the property values at the run time. And it also XAML in knows as to what does the content contain. The most simple and important thing about XAML is that it creates objects and sets properties. Also when you create a WPF application and open any of the XAML files you would see something like this at the top of it. This is simply references to the namespaces so that you could use the components in that namespace. If you are referencing any namespaces in xaml then this is the place to add them. Microsoft took a long time in developing xaml and figuring out how xaml does what it actually does. Here we have root element which is a Window. This Window contains a single child which is Grid. The grid contains other children and it’s the Grid job to assign as to where these children are placed in the layout. So you see a tree root structure. 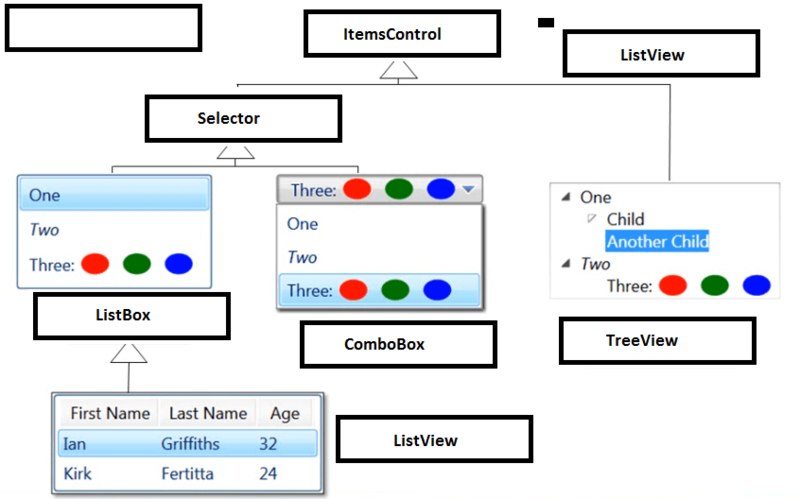 WPF provides two tree structures: The Logical Tree and The Visual Tree. The visual tree will be of use if you are concentrating on the presentation. The Visual Tree is simply the super set of the logical tree. You can see below that all the children of the logical tree are present in the visual tree. So these two trees are the different views of the same set of the objects that make up the UI. The logical tree provides you with the detail to focus on the core structure of the User Interface and to ignore the details of how exactly it is presented. 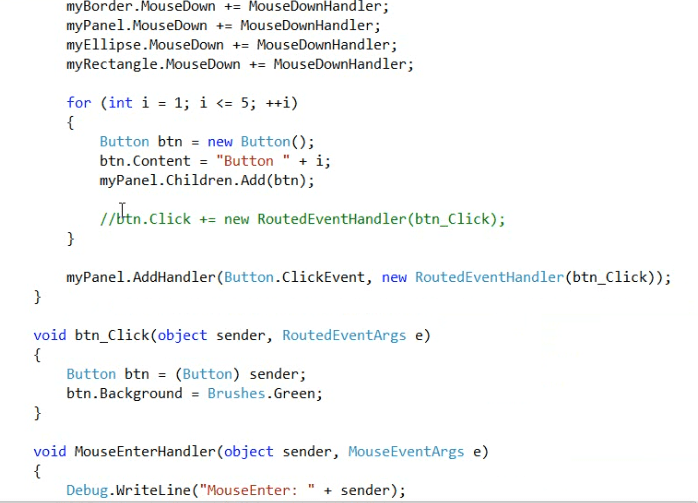 There are two ways for handling input in a WPF application: Events and Commands. Events are very closely tied into the visual tree. Any Mouse or keyboard inputs originate from an element. The one with the focus – keyboard input and the one with the stylus – mouse inputs. As we have already seen that the visual tree was pretty complex for just a couple of elements, you could imagine the complexity if there are a lot of controls in your visual tree. It would become all the more complex if you add an event handler to every element of the visual tree to receive the inputs. To save us from this complexity WPF has Event routing. Event routing allows the ancestor of the element to handle the event. Now there are two types of routing in WPF – Tunneling and Bubbling. Tunneling starts from the root of the visual tree and goes through the tree and reaches the element to which the event is targeted. Generally Preview events are the ones that tunnels. Bubbling Event works in the opposite direction. It starts from the Element and goes up the parent to the root. Main events are the one that bubbles. The concept behind providing a preview is to give the parent element a chance to handle the originating event. For example if you have a button in the Grid and you want to handle the Mouse down event. Now if you want Grid to handle the event before the Button does you need to use the Preview events (PreviewMouseDown) and if you want the button to handle the event first then you should use the main event (MouseDown). Commands on the other hands help you do the same action through multiple inputs like a keyboard shortcut, stylus gesture, menu clicks, button clicks, etc. So that multiple inputs can use the same command if they want same job to be accomplished. Controls in the previous versions like Windows forms correspond to behavior as well and presentation of an element, whereas in WPF controls are a bit different. Let’s take a Button for Example, a button has a click event which is an API feature related to the user interaction. It also supports the content Model for composition which is also an API feature. It supports Focus which is an interactivity feature. It can be associated with Command which is again an API feature. It also supports the Automation API which makes it accessible to screen reader, automation testing, etc. But there one thing that a WPF button cannot do which its activex, Win32 counterparts can. 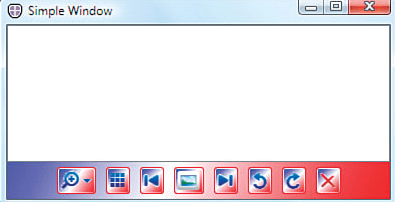 A WPF button is a lookless control which means it has no intrinsic look and it does not know how to present itself. The look of a control in WPF is controlled a distinct entity known as Template. So button may look like a circle or a star but it will still support all the API and interaction features. Let see how this works in code. Use the following code in a WPF application and you would be able set the template property for the button control. You should notice a few things about the code above. We have defined a ControlTemplate for the Button which changes the look and feel of the Button. The Fill property of the Rectangle in the ControlTempalate is done using the TemplateBinding with Background. What this does is binds the Fill of the rectangle to the Background of the Button. So whatever background we set on the Button becomes the Fill of the rectangle. You would also see Curly braces around the TemplateBinding which signifies that it a special property. This is considered to be Markup extension. Markup extension signifies that it would be decided at runtime as how this property will work. This syntax means that we need to create an instance of the TemplateBinding Class with Background as a string and a constructor parameter and WPF expects the whole thing inside the curly braces to derive from Markup extension base class. Now this Base class provides an abstract method named Provide Value. This method would be called at runtime to decide what value will the Fill property have a runtime. A custom markup extension can build depending on what we need. You would also see the same thing as Rectangle Fill Property for TextBlock Text Property. You would now notice that the Content of the Button is now and Ellipse and to make that as the content of the button we need to need to use a ContentPresenter instead of a TextBlock because a TextBlock is a primitive control and it could only display text. So to display the any content we need to use the ContentPresenter and TemplateBind the Content property. So if we want any other content we could do that now. As you have seen that the controls do not define their own look, so are you not wondering as to how do anything appear. Just as we saw above a button control derives its look from its template, and the controls derive their appearance from there templates so is there an infinite loop to look for the template? That’s not the case. 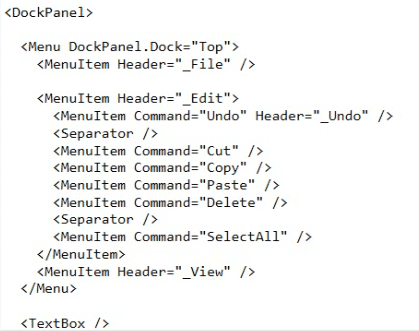 Only the controls have a template and most elements in WPF are not controls. Only the Controls that derive from the Controls Base class are supposed to have some kind of interactive behavior. Examples of controls are Button, TreeView, ListBox, TextBox, etc. Only the Controls derived from the Controls class have a template because it’s the Control class that introduces the template property. Examples of Elements are Rectangle, Ellipse, Image, TextBlock etc. These do not derive from Controls and are more primitive and derived from FramworkElement (Base class for Controls as well). These elements do not have a template of their own and as they are more primitive and there presentation is specifically designed. Primitive elements are the one that provide an intrinsic appearance for them. These can be also considered to be lookful controls. Primitive elements do not have any intrinsic behavior of their own and you have to add the events and handler to get some interactive behavior from them. You might note that a lot of elements that do not derive from the Control Class are placed in the namespace System.Windows.Control. This is confusing you should keep in mind that the Elements that derive from the Control Class are Controls. The new and useful feature in WPF is the Layout primitive also known as Panels in have. The Panles are required at places where we need to position multiple childrens. The panels available in WPF are Grid (Advanced table/grid-based layout), Canvas (Fixed layout, supports anchoring), StackPanel (left to right and top to bottom layout), DockPanel (Docking layout) and WrapPanel (Flow-like formatting). 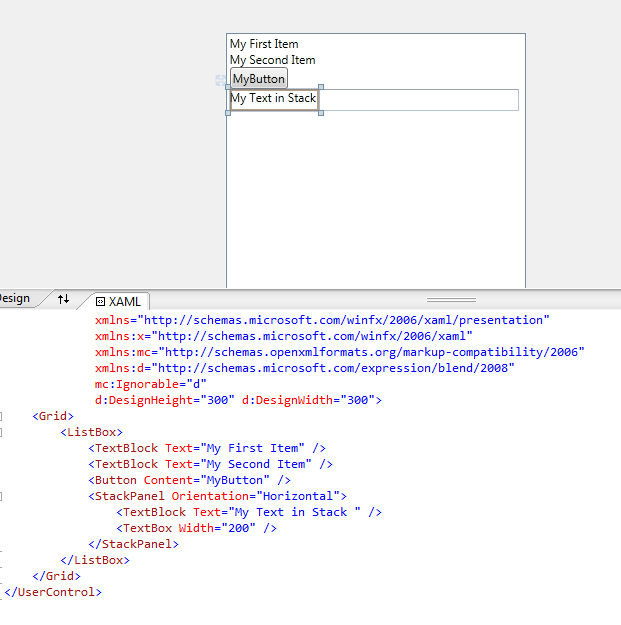 WPF provides a flow layout for the text so that the text fits into whatever space is available. A Flow document has a HTML-like feature set and it has reader controls. In a flow document we can integrate any mixture of text styles, user interface elements, HTML features (Lists, floating data, etc). WPF makes it much easier to render text in columns than HTML which is very useful because columns allow shorter line lengths which improves reading speed. When you come across data binding you would think about databases or collections but in WPF databinding has much broader scope. Data Binding can be used at times when you want to present any data to the screen. WPF data binding either connects to objects or xml. WPF never assumes the presence of a database. Infact you never use data binding directly with database. You load the data from the database into your domain objects, datasets, etc and then data binding presents them on screen. Data Binding brings up a very interesting concept in WP Known as DataTemplate. Similar to ControlTempalate which defines how a control should look like, DataTemplate defines how the data should look like. So you define the template for a particular class of application and the template can be used to present the data on the screen. Its because of the power of Data Template that WPF does not contain a DataGrid as you could define how the data should be presented on screen. Click Once deployment but is supported only in full trust environment. 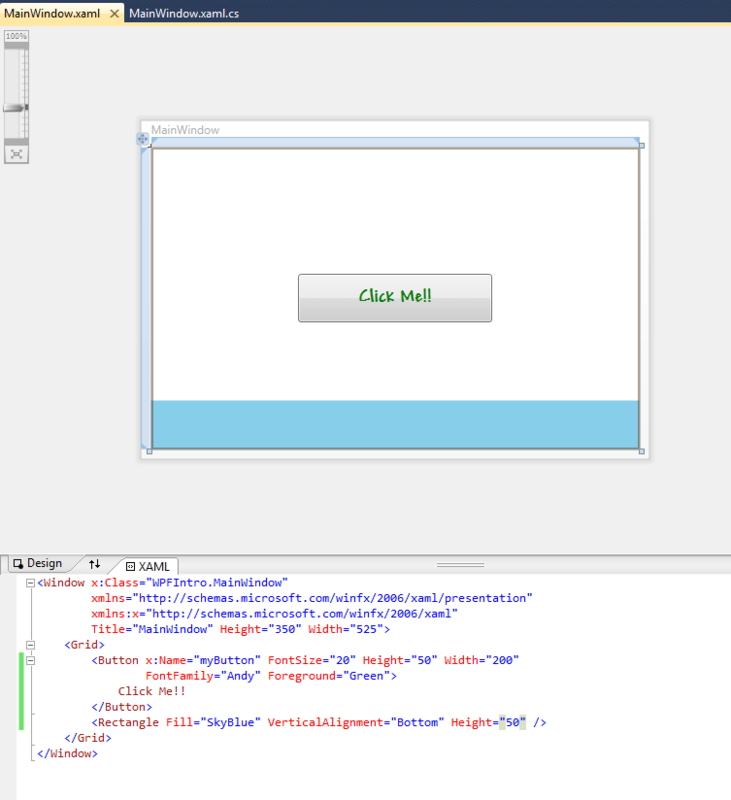 XBAP – XAML Browser application. This is like the Click once but imparts the experience like the java applet style. This does not require full trust as it runs in browser. The code for this post can be downloaded here. Hey guys. Today i am going to discuss about the MediaElement in Silverlight and see how we can put it in use in Silverlight and WPF applications. We can integrate media into our Silverlight pages and WPF UserControls. To add media to the Silverlight page just add a MediaElement to your XAML and provide a URI (Uniform Resource Identifier) to the media to play. The code below will show you how to create a MediaElement and set its Source proprty to URI of a video file. You can add the video file to Visual Studio project also and then set its property to Resource and the MediaElement will begin playing when the page loads. Note – The MediaElement object can play WMV (Windows Media Video), WMA (Windows Media Audio), MP3 Files. The MediaElement object provides several media-specific properties. The following list describes the commonly used properties. The following example illustrates typical features of a video player including playback control, a progress/seek slider, and full screen toggling. Smooth Streaming is an IIS (Internet Information Services) technology that enables adaptive streaming over HTTP to Silverlight clients. Smooth Streaming breaks video feeds into small fragments which enables it to quickly alter the quality of the video, depending on the current bandwidth of the client. This creates a high-quality viewing experience that scales massively on content distribution networks. For more information on Smooth Streaming, see the IIS Smoothing Streaming site. For an indepth example of Smooth Streaming, see the Microsoft Silverlight Media Framework CodePlex project. We could not only use and extend the controls present in the visual studio toolbox for Silverlight but also there are multiple providers offering additional controls for Silverlight framework. XAML stands for eXtensible Application Markup Language and hence it’s possible to add import external elements into a document without breaking rules. Now we can define a set XML namespace (xmlns) in XML and can map a unique identifier to a prefix so that the XML parser can use additional rules while loading the document. Lets say we want to add double value in the document resources. Now as you would know that XAML is by default configured for User Interface elements, the default XML namespaces will not map to Double types so we have to add the line of code shown in Bold in your XAML other than the normal code. So we are including the mscorlib namespace which contains the Double type definition and then referencing the same in UserControl.Resources and then we have referenced the same as a static resource. CLR Namespaces – Used in .NET code to group the classes logically. XML Namespaces – Used to extend XML document with additional declarations. Silverlight elements are defined into two namespaces. The first one is a Unique Resource Identifier (URI) mapped to the default xmlns (http://schemas.microsoft.com/winfx/2006/xaml/presentation). In fact, multiple CLR namespaces (such as System.Windows.Controls, System.Windows.Shapes, and so on) are mapped to this URI. This allows us to use all the types within these namespaces without having to use a prefix. For example, we write <Button Click=”Button_Click” /> and not <anyPrefix:Button Click=”Button_Click” />. Note that this URI is not a website’s address, and entering it into a web browser will not lead you anywhere. It is just a Unique Resource Identifier, a unique name. The other namespace used by Silverlight by default is http://schemas.microsoft.com/winfx/2006/xaml, another URI, which is mapped to the x prefix. Inside this namespace are defined additional properties that can be applied to any element. We can map our own URI to a group of namespaces and this is useful because we can consolidate multiple CLR namespaces into one single URI and also this would hide the CLR namespaces that our code is using. And later when we decide to move some classes to different CLR namespaces we don’t need to change the XAML code. This is also very useful in creating data objects and it also makes data binding easier. I know you would say that you know what it is but lets start with a formal definition of Control. A Control is an element of software, encapsulating some functionality related to user interface. 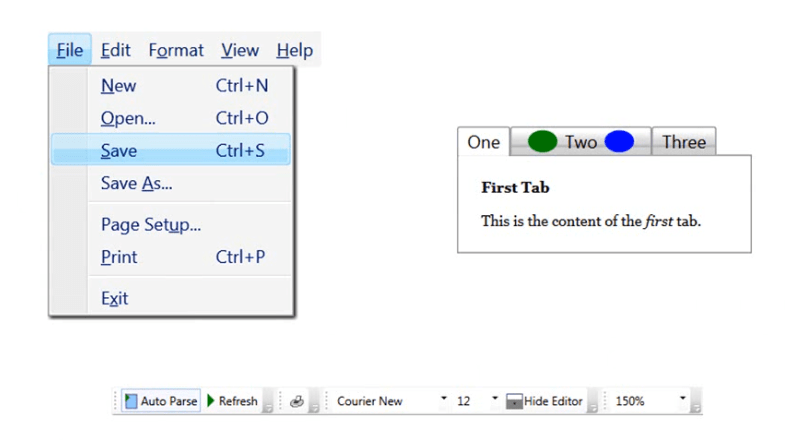 Now in Silverlight there are two kinds of controls User Control and Custom Control. A user control is a logical group of other controls. It is typically used to separate a user interface in smaller parts that are easier to code and design. In fact, in Silverlight, all the pages of an application are user controls. The App class (defined in App.xaml and App.xaml.cs) is the main point of entry for the Silverlight application. This is also where the MainPage control is created and assigned. If you rename the MainPage control to a different name, you must also change the name in the RootVisual assignment, or else your application will not compile anymore. The custom controls are made of code only as against XAML (Front End) and a code behind file. All controls build in Silverlight are lookless. The custom control file defines only the controls functionality i.e. Properties and methods and its behavior is defined by its states and parts. 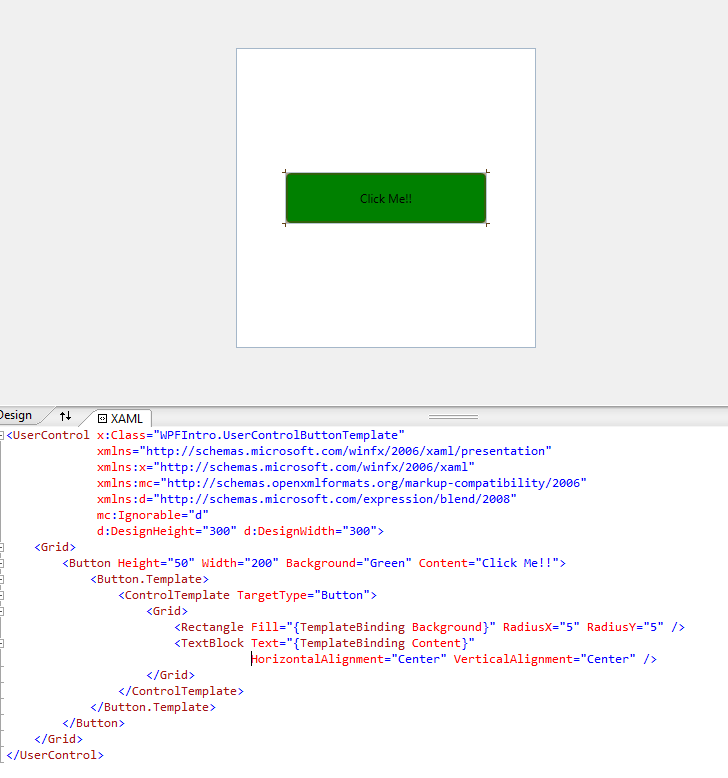 For the controls to be visible, a XAML front end must be defined, though. An invisible control is not very usable! One control can have multiple appearances, defined in as many control templates. We talk out a separation of concerns: The control’s code defines its functionality; the control’s template defines its appearance. Typically, a developer implements the control, whereas a designer styles and templates it. The user defines a threshold and a value, both of type Double. If the value is higher than the threshold, the control is in High state. If the value is lower than the threshold, the control is in Low state. If the value is equal to the threshold, the control is in Equal state. Both the threshold and the value can change dynamically, be data bound, animated, and so forth. The user can click one part of the control to increment the value by one unit, and another part to decrement by one unit. The control can be disabled, in which case clicking does not change the value. Now as you see we have the functionality of the custom control but not how the control will look so the developer can start working the designers can do the designing part simultaneously. In Visual Studio, select File, New, Project from the menu. In the Add New Project dialog, in the Silverlight category, select Silverlight Class Library. Enter the name CustomControlsLibrary and click OK. Make sure that you select Silverlight 4 in the next dialog. This creates an assembly, a library that can be referenced in multiple applications but cannot be run on its own. Delete the file Class1.cs in the Solution Explorer (because will not use it). Right-click the CustomControlsLibrary project in the Solution Explorer, and select Add, New Item from the context menu. In the Add New Item dialog, select the Silverlight, and then select a Silverlight Templated Control. Enter the name ThresholdControl.cs and click Add. According to the requirements, the control has two state groups. We will call these the Common states (Normal, Disabled) and the Threshold states (High, Equal, Low). Note that the states within a state group are mutually exclusive; that is, the control cannot be simultaneously in Normal and in Disabled state. However, it can be Normal and High, or Normal and Low, and so forth. Defining the states and states groups is done with the TemplateVisualState attribute on the class. The requirements also state that the control has two parts with a special meaning: Clicking them increments or decrements the value. Here too, we use an attribute to define the parts on the class: the TemplatePart attribute. What is a resource (in terms on .net)? A resource is a noncode piece of an application or compnent like bitmaps, fonts, audio / video files, string tables. Loose files that are not known to the applcation to the compile time. Now we can also categorize binary resources into Localizable (change depending on the current culture) and Non Localizable (do not change based on culture). Lets see how can we define access and localize birary resources. 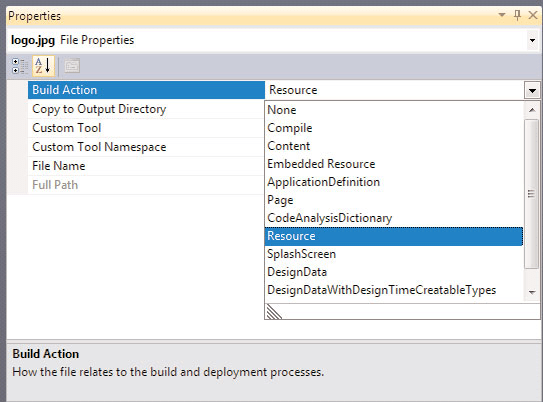 As shown in the image below, you select the Build Action property and set it to either Resource or Content. Select Build Action as Resource when you want to include your resource in the assembly and Select Build Action as Content when you want your resourcfe to be a loose file and only the existence and relative location of the file sould be included in the assembly. 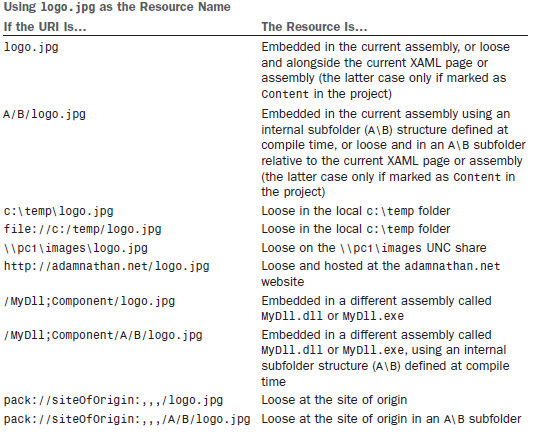 Now if you would have noticed the above image carefully (you can have a look again if you want) then you will see there is another value by the name of Embedded Resource (this also embeds the resource into the assembly just like Resource). The use of this value is not recomended in WPF as this property belongs to old .net and was ment to be used with Windows Forms. Also if you select your resource to an Embedded Resource then you will not be able to access it in XAML (unless you write some custom code for the same). Note – A compiled XAML cannot reference a binary resource in the current directory via its simple filename unless it has been added to the project. For accessing files that are not added into the project either give the full path of the resource or access resource using Site of Origin url. Below here is the list present for refernce of how to acces which binary resource. So the above lines of code will instantiate a System.Windows.Media.Imaging.BitmapImage object which ultimately derives from the abstract ImageSource type and this will work with popular image formats such as JPEG, PNG, GIF, BMP. The use of pack://application:,,,/ works only with resources belonging to the current project marked as Resource or Content. To reference relative loose files with no relation to the project, the easiest approach is to use a siteOfOrigin-based URI. 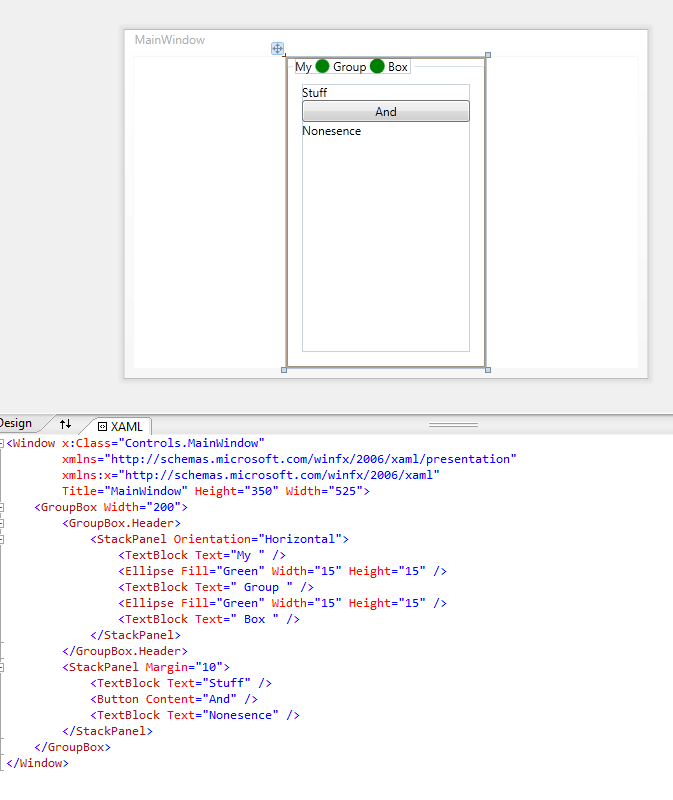 Running this gives every object element in every XAML file in the project an x:Uid directive with a unique value. You can add this MSBuild task inside your project before the Build task, although this might produce too much noise if you rebuild often. This generates a simple .csv text file containing all the property values you should need to localize. You can edit the contents of this file so it correctly corresponds to a new culture. (There’s no magic in this part of localization!) If you save the file, you can then use LocBaml in the reverse direction to generate a new satellite assembly from the .csv file! This new satellite assembly needs to be copied to a folder alongside the main assembly with a name that matches the culture (fr-CA in this case). To test a different culture, you can set System.Threading.Thread.CurrentThread.CurrentUICulture (and System.Threading.Thread.CurrentThread.CurrentCulture) to an instance of the desired CultureInfo. 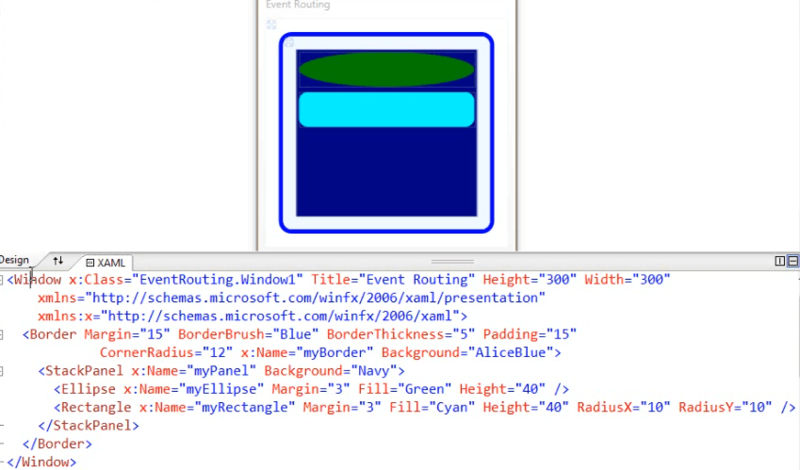 Lets see an XAML code for a logical resource which is Brush. 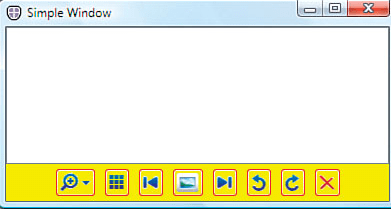 The following example shows a simple windows with a row of buttons along the bottom which can be used in a photo gallery user interface. This example shows how to apply custom brush to each Button’s Background and BorderBrush.